eTravel services allow customers to review a wide range of deals and to find their perfect travel experience. The worldwide revenue of US$756.8 billion in 2018 is expected to increase to US$1,064.3 billion by 2023. 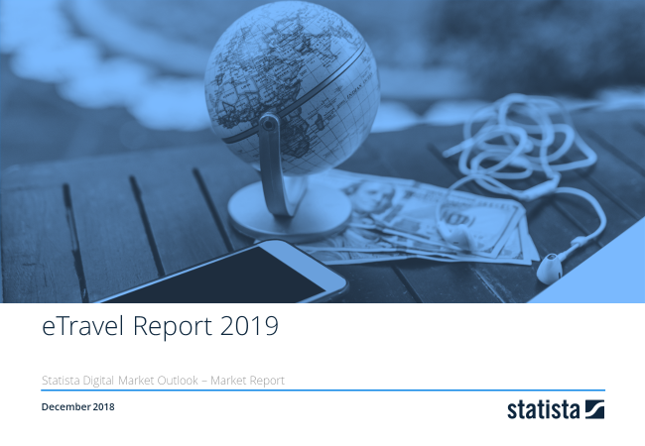 In this report, the eTravel market is divided into two major segments, covering different product categories: Online Travel Booking and Online Mobility Services. eTravel is one of the hot topics when it comes to digitalization and disruptive changes to traditional industries. eTravel services allow customers to choose their travel experience from a wide range of deals. The globally rising number of internet as well as smartphone users also impacts the adoption of online travel bookings and drives growth. When looking at the three major eTravel markets, the US, China and Europe. The U.S. was the biggest market in 2018 will also stay at the top in 2023. The report covers the sale of online services and digital goods via the internet. The definition includes online travel bookings (package holidays, hotels and vacation rentals) and online mobility tickets for services such as flights, long-distance bus tickets, train travel, car rentals and ride hailing services. The ticket reservation or purchase can be completed on a desktop PC or via mobile devices (Smartphones or Tablets). The eTravel market contains the following market segments: Online Travel Booking and Online Mobility Services.